Having a bad foot day? You may be surprised to know that your feet are not supposed to hurt and	most foot problems can be resolved with early medical intervention. 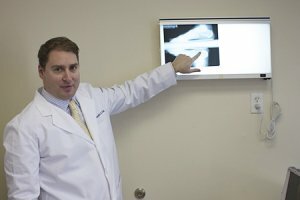 If	you are having a foot problem, you are not alone; twenty percent of the	population seeks help for a foot problem every year. Do you or someone you know have chronic heel pain? This condition is known	medically as Plantar Fasciitis. If your answer is yes to the above question, you may be interested in a	relatively new alternative treatment called	extracorporeal shock wave therapy (ESWT), a non-invasive procedure in which strong sound waves are directed at	the area of pain. The device used for ESWT is very similar to the one	currently used in non-surgical treatments of kidney and gall-bladder stones. This device generates strong shock waves at the treatment site. The ESWT	treatment takes about 30 minutes and is performed under local anaesthesia	and/or ‘twilight’ anaesthesia. ESWT is an out-patient procedure	and does not require an overnight stay in the hospital. In the U.S. alone, about two million cases of heel pain are reported each	year and many are debilitating. ESWT has proven to be extremely effective	in treating such conditions as plantar fascitis, commonly known as heel	spurs. ESWT has also been used to treat tennis elbow and Achilles tendonitis.